Accurate & Long Probe: Temperature measurement accuracy: accurate to ±1 degree (between -50°C to 300°C/ -58°F to 572°F). 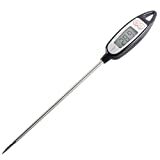 With Extra Long Probe(20MM), Digital Meat Thermometer is easy to use and ensures you can grill meat to your perfect doneness knowing it won’t be under cooked or burnt. Please keep your hands away from the heat when cooking at the grill or in the oven. Auto On/ Off: The Thermometer will turn off automatically after 10 minutes if no other buttons are pressed. With power saving function, longer battery life. °F/ °C Button: °C/°F Configurable . The wide temperature range of -50°C to 300°C (-58°F to 572°F) makes these utensils the best for use when grilling on your gas BBQ or turkey fryer, making candy, using hot oil to deep fry, brewing beer and wine and even making cheese and bread. We are offering 12 months warranty. In the rare event when you have a complaint or problem, contact us before leaving any negative product review. Perfect Doneness: The Digital Food Thermometer help you to achieve Your Perfect Doneness every time and say goodbye to burnt and undercooked Food . It’s easy to use, accurate and priced right. The wide temperature range of -50ºC to 300ºC(-58ºF to 572ºF) makes these utensils the best for use. Easy to Use & Clean: Simply insert the long temperature probe into your food / liquid and get perfectly cooked food every single time. And the thermometer probe is stainless so you can clean the probe with a damp cloth after use. ● Do not leave thermometer in oven while cooking. ● Do not put this product inside the roaster. ● Do not hang the handle on the side of pan, barbecue grill. ● Do not touch hot probe with bare hands. ● Wash the metal probe in soap water. Clean thermometer by hand. Do not completely immerse in water. ● The metal probe can be sterilized by soaking in boiling water for several minutes.